The meeting spot was at the park entrance gate on Whispering Pines Dr/McAbee Rd. Unfortunately, there is no dedicated parking lot here for the county park and you need to park on the street. It can get pretty crowded in the morning, on a weekend. We found a parking spot almost a mile away from the park entrance! There were a few folks from the meetup group who were waiting at the entrance. A few more kept trickling in until 10:40 AM. There was, however, no sign of the meetup organizer yet and everyone was getting restless. One of the women from the group (she had a dog) claimed to have hiked the route that the organizer was planning. 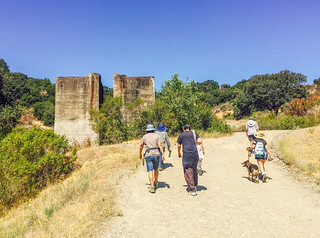 So she volunteered to lead the group for a 5-mile hike. There were nine of us. 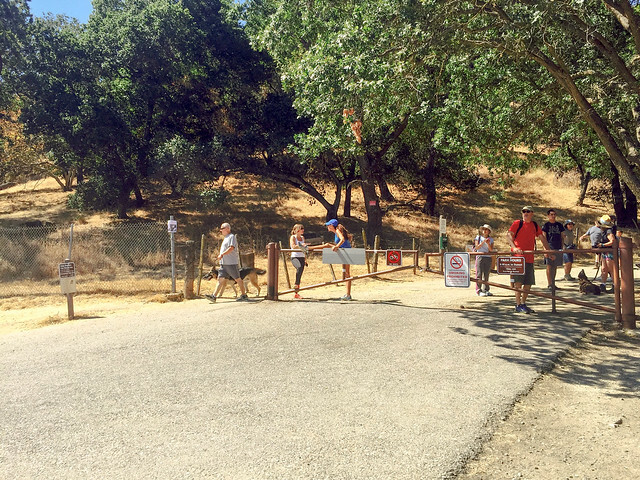 We started our hike at the Mine Hill Trailhead, which is 0.2 miles from the park entrance. There are remnants from the mining era all over the park. There was hardly any shade; the trail is completely exposed to the sun. 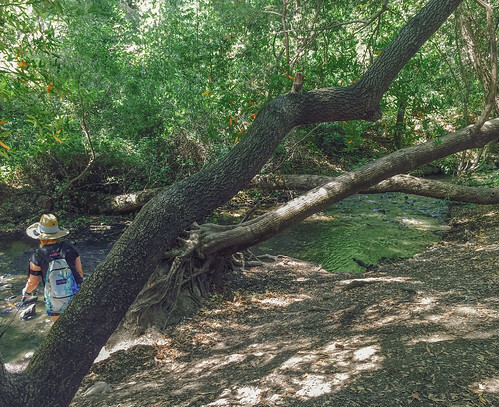 We took the Senador Mine Trail and followed the Guadalupe Trail to reach the Guadalupe Dam and Reservoir. It was mostly an uphill climb and I found this hike tougher than the PG&E trail, partly because of the lack of tree cover. Thankfully, there was one shaded rest stop a mile before the reservoir, near the Guadalupe Creek. The view of the reservoir snuggled by the surrounding green hills makes the hike (read as sweating and panting) worthwhile. 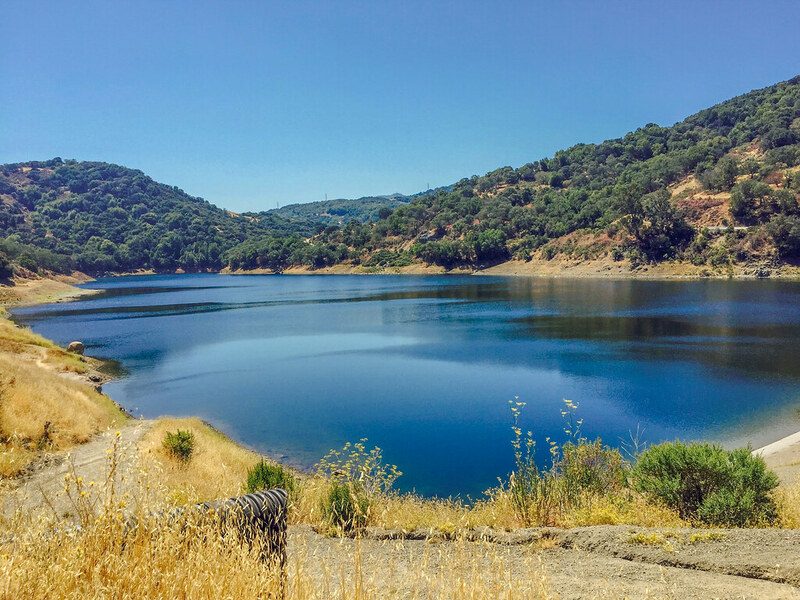 The hike beyond the reservoir was basically about heading back to the Mine Hill Trailhead, via the New Almaden Trail, which is mostly a single-lane trail, shaded for most parts. 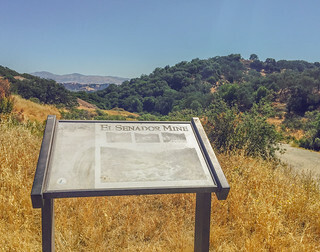 The Mine Hill Rd and Cinnabar Trail provide the switchback from the Guadalupe Trail to the New Almaden Trail. 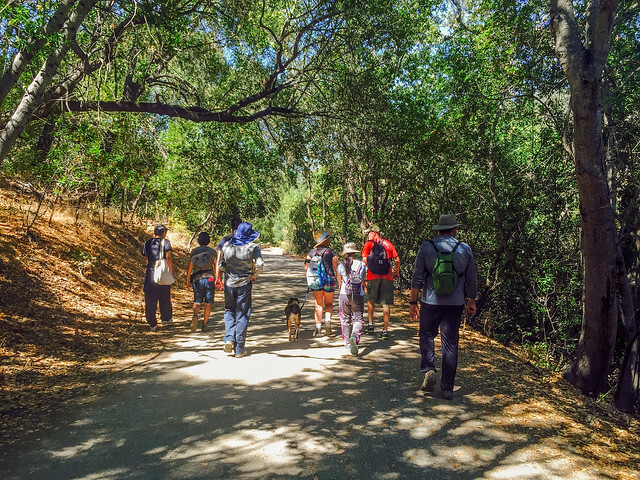 The Guadalupe Trail and New Almaden Trail are boring and dull in comparison to the PG&E trail. There are no vistas of the valley or the bay, just the hills around, which stop fascinating you after a while in your bid to catch your breath. 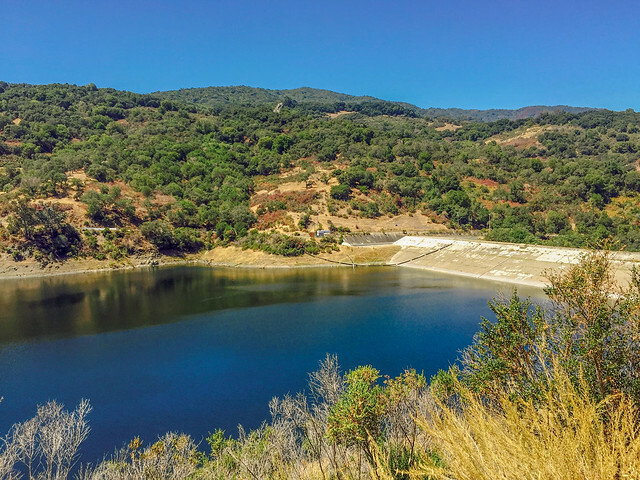 The only scenic spot along the way is the Guadalupe Reservoir and Dam. It was fun to walk with a group. There were so many conversations. One of the guys had hiked in many other states and it was interesting to listen to his stories, experiences, and tips. 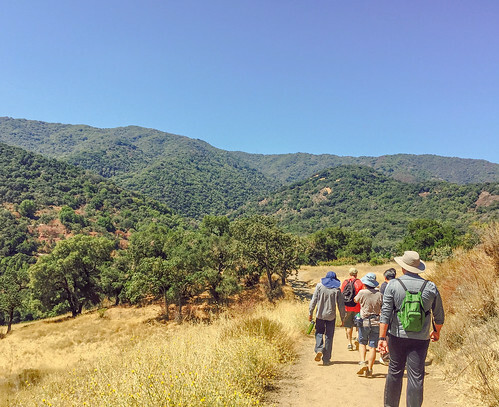 When walking with a group, you need to hike at their pace. You also need to stick to the scheduled rest breaks the group takes, which might be more or less than what you need. 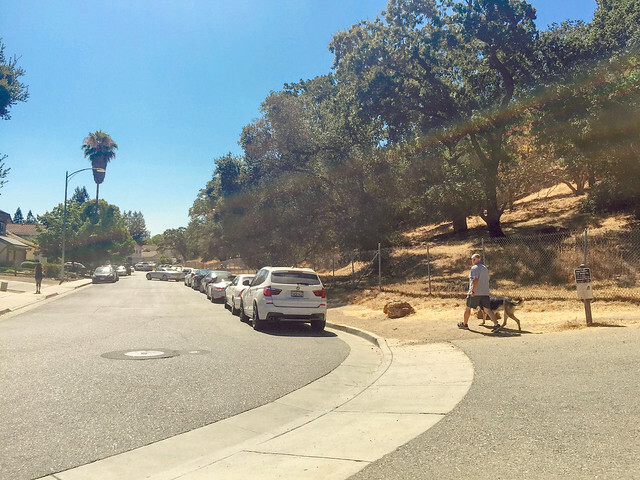 We spotted three deers close to the New Almaden Trail. Parking Lot: None near the Mine Hill Trailhead. You need to park on the street (McAbee Rd or Whispering Pines Dr). Approximate location: 6528 Whispering Pines Drive San Jose, CA. Tough to find a spot in weekends. Restrooms: There are a few portable toilets at the Mine Hill Trailhead. Map: Paper maps are available at the Mine Hill Trailhead. Exposure to sun: The Guadalupe Trail is mostly exposed. The New Almaden Trail has a thin tree cover all throughout.